Chalet in the heart of woods and spa .centre var. Property 11: Chalet in the heart of woods and spa .centre var. The Villa 'Les Amandiers' is 5 km from Ste. Maxime and the sea. Property 19: The Villa 'Les Amandiers' is 5 km from Ste. Maxime and the sea. Chalet charming quiet amid the pines and oleanders. Property 21: Chalet charming quiet amid the pines and oleanders. Property 34: Charming house in a private park, arborté and quiet. St. Tropez, cozy beach house @KonTiki, right on the beach. 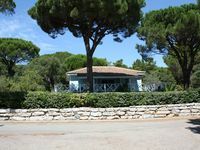 Property 44: St. Tropez, cozy beach house @KonTiki, right on the beach. The tiny house was brand new and had all the equipment we needed for a couple of days. Air conditioning was a bonus and necessary as the days were 35+. Bring your own towels and linens. The campsite itself has a great baker and a small casino store. The restaurant wasn't great and the pool closed too early for us. The beach is about 5 minutes from the tiny house, and there are opportunities to rent umbrellas and chairs or simply throw your towel down and just jump into the sea. The water was 25-28 degrees while we were there and wonderful. We spent 5 days at the chalet at the end of Septemeber and were spoilt with very good weather. 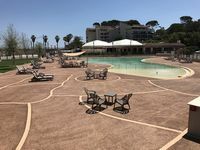 It suited us perfectly - set back from the rest of the park it had more space and a better setting than the other chalets with a large veranda around the outside, lovely bright, new interior and came well equipped. Was perfect for sunbathing in peace and quiet, eating outside and as a base to reach the nearby beaches and villages. The end of season regatta Les Voiles was on during the week which we would highly recommend although as expected the route in to St Tropez wasn't much fun with several miles of traffic jam so we would recommend getting there early especially for the Saturday market which is fantastic! The property managers were very sweet and were on hand to help although there seemed to be nothing which we lacked. All in all a great holiday.